Rotary vacuum pumps – double stage. 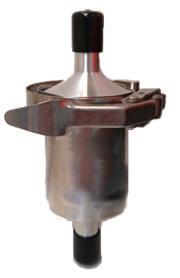 This miniature two stage pump features an alternative inlet connection position at the side of the pump so that overall installation height can be reduced to a minimum when required. Ultimate vacuum (without gas ballast): 1.1x10-3 torr. Ultra Grade 19 oil is recommended for use with the E2M1. In high vacuum mode it is ideal for backing turbo pumps, analytical instruments, and electron microscopes. Configurable for high throughput mode. Ultra Grade 19 oil is recommended for use with the RV3. Rotary vacuum pump; Double stage. Ultra Grade 19 oil is recommended for use with the RV5. Ultimate vacuum (without gas ballast) 1.5x10-3 torr. Ultra Grade 19 oil is recommended for use with the RV8. Vacuum Pump Exhaust Filters for Vacuum Rotary Vane Pumps remove all visible oil mist and smoke from vacuum pump exhaust, even when it is saturated with oil. The high efficiency filter cartridge continuously drains the collected liquid, allowing the user to recover expensive lubricating fluid. Filters are for pumps with flow ratings ranging of 3 cfm and non-hazardous/non-corrosive applications. Port size is ½" NPT. We are pleased to offer not only the vacuum pumps but also the oil mist filters to help you deal with exhaust mist from the pump which sticks to any surface that it touches and becomes a dust magnet. Mist filters capture oil mist from the outlet of pumps, which would otherwise be ejected into the atmosphere. This may happen when you use gas ballast or when you pump high gas throughputs. You can also return oil trapped in the mist filter back to the pump, although you must ensure that the process gases will not contaminate the pump or pump oil. For the E2M1.5 use the EMF3. For the RV3, RV5, and RV8 use the EMF 10. The EMF10 mist filter is suitable for use with RV3, RV5 and RV8 pumps. They are very efficient at 99.999% DOP test and are also azide proof. The white bottom half of the body is semi-transparent, allowing the oil level to be monitored. The EMF filters have a unique odor element which neutralizes the smell of oil mist. These rechargeable in-line traps effectively block oil backstreaming from mechanical pumps. Any mechanically pumped system, even one with a turbo pump, should have a foreline traps. The trap is placed in the foreline between the roughing pump and the diffusion or turbo pump. It uses a disposable, oxygen-free copper maze absorbent which requires no liquid nitrogen and will not hold water. Typically the maze is replaced every 1-2 years. The seamless body is available in aluminum. Replacement elements (Copper Maze) also available. * Available in stainless steel upon special request. 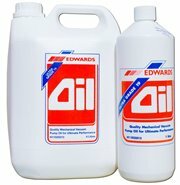 Edwards Ultragrade 19 Oil is specially recommended for use in clean pumping applications. The oil offers reduced maintenance cost, longer fluid life, and a cooler running pump.